The aptera of Aphis craccivora is dark brown with (usually) a very solid black shiny carapace from the metanotum to abdominal tergite 6. 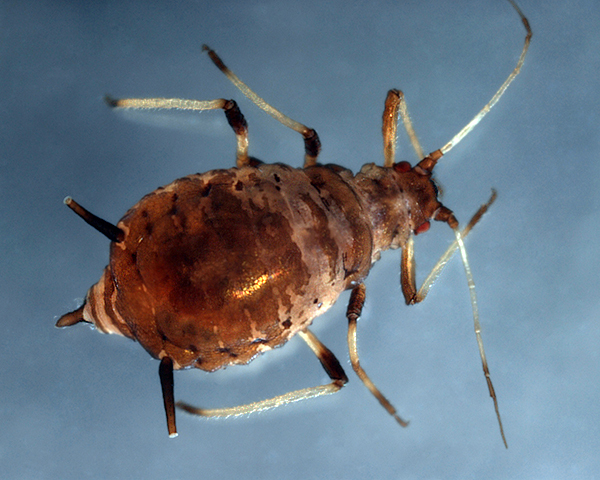 Many North American and a few southern European Aphis craccivora populations have a reduced sclerotic shield. The longest hair on the third antennal segment is usually 0.5-0.6 times the basal diameter of that segment (cf. Aphis pseudocomosa which has the longest hair on the third antennal segment 0.67-1.38 times the basal diameter of that segment). Their siphunculi very rarely have any trace of constriction before the flange, and are 1.2-2.2 times the length of the cauda (cf. Aphis loti which has the siphunculi 0.8-1.5 times the length of the cauda). The cauda has the distal part tapering and is 0.09-0.13 times body length (cf. Aphis loti which has the cauda finger-like, almost parallel sided on the distal part). The body length is 1.16-2.3 mm. Aphis craccivora alatae (see second picture above) have the dorsal shield broken up into segmental bands with large marginal and postsiphuncular sclerites. Immatures are lightly dusted in wax. 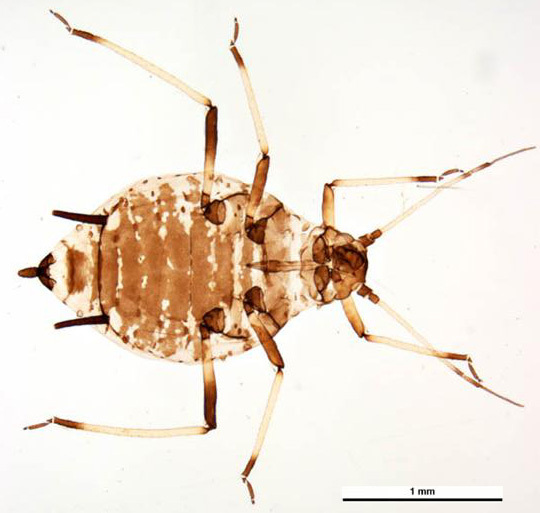 The clarified slide mounts below are of adult viviparous female Aphis craccivora : wingless, and winged. Micrograph of clarified mounted aptera (first image) courtesy PaDIL. Copyright Simon Hinkley & Ken Walker (Museum Victoria) under Commons Attribution 3.0 Australian License. Alate micrograph (second image) courtesy Favret, C. & G.L. Miller, AphID. Identification Technology Program, CPHST, PPQ, APHIS, USDA; Fort Collins, CO.
Aphis craccivora prefers plants in the Fabaceae (beans, peas and groundnuts), but it is highly polyphagous and has been found on many plant species. It feeds on the young shoots, leaves, flowers and fruits, and is strongly ant attended. In most places reproduction is entirely parthenogenetic with no sexual stage in the life cycle, but sexual morphs have been recorded from Germany and India. Aphis craccivora is a vector of several viruses including broad bean mosaic virus, cucumber mosaic virus and groundnut rosette virus. The cowpea aphid has a cosmopolitan distribution. It is not very common in cool temperate countries, but can be abundant in warm-temperate and tropical regions. 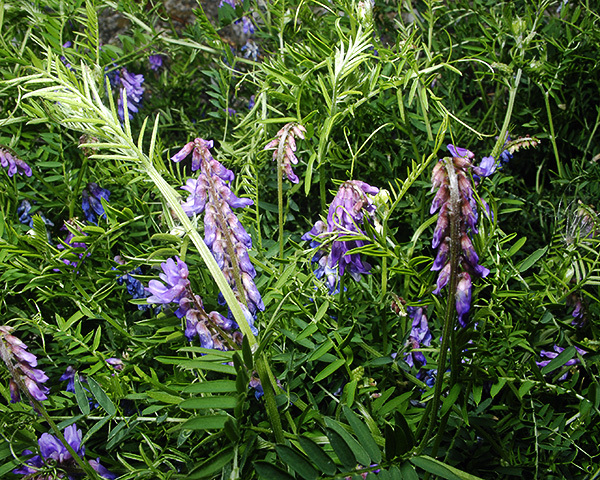 We have found Aphis craccivora feeding on garden Vicia cracca (tufted vetch) at Shoreham-by-Sea in West Sussex. Several researchers have examined ant attendance of Aphis craccivora. Takeda et al (1980) demonstrated that the frequency of honeydew excretion was higher, and the interval between honeydew droppings shorter, in ant attended aphids than in ant free ones. Katayama & Suzuki (2002) compared the costs and benefits of ant attendance for Aphis craccivora with reference to aphid colony size. The presence of ants shortened the residence time of the coccinellid larva on a plant and reduced the proportion of aphids eaten. A larger aphid colony was found to increase the benefit and decrease the cost of ant attendance. Katayama et al (2013) evaluated relationships among the intensity of ant attendance, honeydew composition, and aphids' endosymbionts. The experiments demonstrated that there was a difference in the sugar composition of honeydew between clones, but that the endosymbiont Arsenophonus did not influence this difference. Tokunaga & Suzuki (2008)compared colony growth and dispersal of the ant-tended Aphis craccivora and the non-ant-tended Acyrthosiphon pisum in the absence of predators and ants. The increase of the dispersal rate with density was greater in Acyrthosiphon pisum than Aphis craccivora. Acyrthosiphon pisum has longer legs, higher walking speed, and stronger tolerance of starvation all of which favour dispersal by walking. Aphis craccivora on the other hand lacks such morphological and behavioural traits, because increasing colony size without dispersal is likely to be advantageous for ant attraction. The proportion of alatae in Aphis craccivora was higher than in Acyrthosiphon pisum. 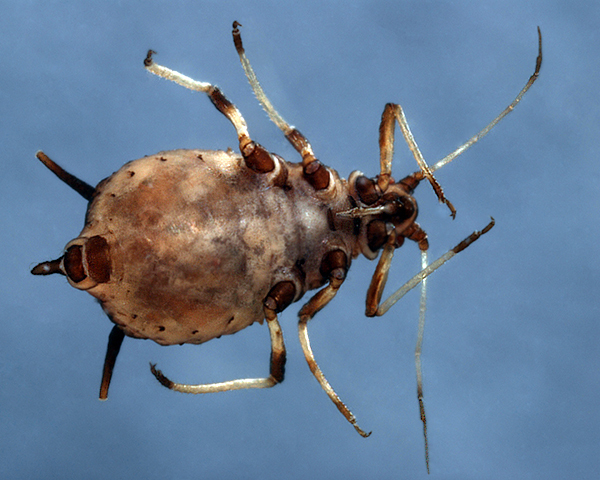 Aphis craccivora is one of relatively few aphids that are pests in the tropics Its ecology has been studied intensively in Africa, India and Australia. Davies (1972) looked at the ecology of Aphis craccivora in Uganda where it is a major pest of groundnuts. Aphids were found to spend the dry season on two common Euphorbia weeds and on volunteer groundnuts. The latter were an important source of groundnut rosette virus and the vector. Field studies showed that aphid numbers increased rapidly on the groundnut crop 31-45 days from emergence but declined rapidly as the plants matured. Coccinellids, especially Cheilomenes sulphurea, were important predators. Aphid numbers were far higher on groundnuts with low plant densities, but the number of plants infested was not significantly different at high and low densities. In Nigeria Ofuya (1995) looked at the abundance of coccinellid predators in some varieties of cowpea following artificial aphid infestation. Highest aphid densities developed in the susceptible varieties. Larvae of coccinellid predators were also more abundant in the susceptible than in the resistant varieties. Cage evaluations of one variety indicated that aphid resistance could complement the activity of the coccinellid in reducing the population densities of Aphis craccivora and damage to infested plants. In Malawi Farrell (1976) looked at the effect of plant spacing on the population dynamics of Aphis craccivora on groundnuts. Three plant spacings (30 cm, 7.5 cm and 2.5 cm) within rows 90 cm apart, were used in three field trials. Aphid density per infested plant was consistently higher, while numbers of aphid-infested plants per unit area were consistently lower, in 30 cm than in 2.5 cm spacing. Aphid numbers per unit area increased to similar levels at all spacings in crops under 40-50 days old, but subsequently aphid density was consistently lower in 2.5 cm than in 30 cm spacing. This effect could not be related to the intensity of fungus disease infection, parasitism, predation, the availability of feeding sites or the rate of emigration. The potential rate of increase was found to be consistently lower in 2.5 cm than in 30 cm spacing. The rate of plant growth was relatively depressed in 2.5 cm spacing, particularly after 40 days. The effect of spacing on aphid numbers was attributed to the effect of host-plant condition on the potential rate of increase. In Australia the cowpea aphid is the most important vector of subterranean clover stunt virus (SCSV) to crop and pasture legumes. 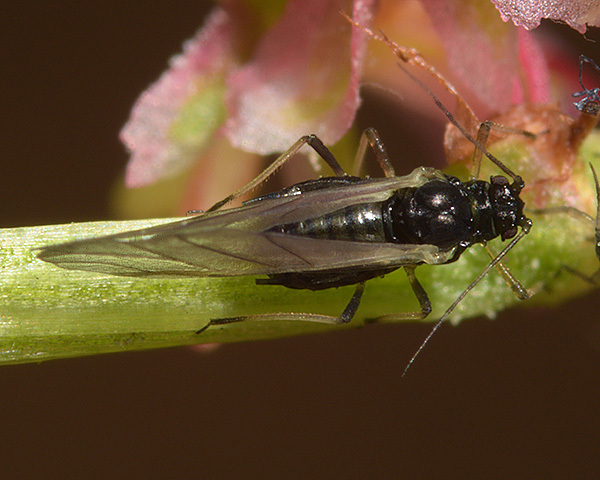 During the autumn, winged cowpea aphids infest newly germinated pastures throughout south-east Australia bringing with them the virus. However, the cowpea aphid is an extremely cold-susceptible species, and does not generally survive the winter in most areas. Gutierrez et al. (1971) examined the ecology of the cowpea aphid and SCSV in five pastures which were sown with different combinations of pasture legumes. They showed that sub clover (Trifolium substerraneum was probably the most important host for SCSV in nature. Gutierrez et al. (1974) assembled various components of the biology of the cowpea aphid (Aphis craccivora Koch), subterranean clover stunt virus and their host plant in a simulation model. They concluded that the species is primarily a warm weather species and that it is not adapted to breed in the temperate climate of south-east Australia. Gutierrez et al. 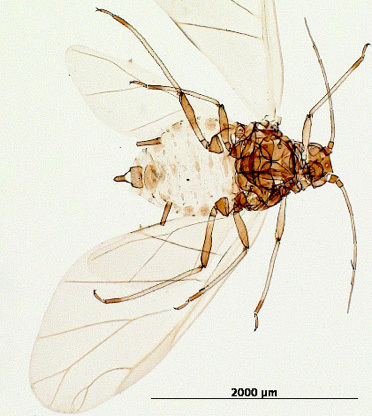 (1974) discuss the climatic traits for the development of populations of Aphis craccivora in south-eastern Australia, relating its migration and colonisation to climate. They concluded that climate is the main factor concerned, successful development depending on a series of biotic and climatic events favouring migration, establishment and dispersal. It was hoped that the model developed by the authors could be used for predictive purposes, but in practice the model did not prove very useful. Worldwide populations of the aphid Aphis craccivora are infected with various facultative bacterial symbionts which have been shown to mediate ecological interactions, including host protection against natural enemies. Brady et al (2014) investigated facultative symbiont species richness and prevalence among 44 world-wide populations of the cowpea aphid. They found two significant associations between facultative symbiont and aphid food plant: the symbiont Arsenophonus was found at high prevalence in Aphis craccivora populations collected from Robinia sp. (locust), whereas the symbiont Hamiltonella was almost exclusively found in populations from Medicago sativa (alfalfa). 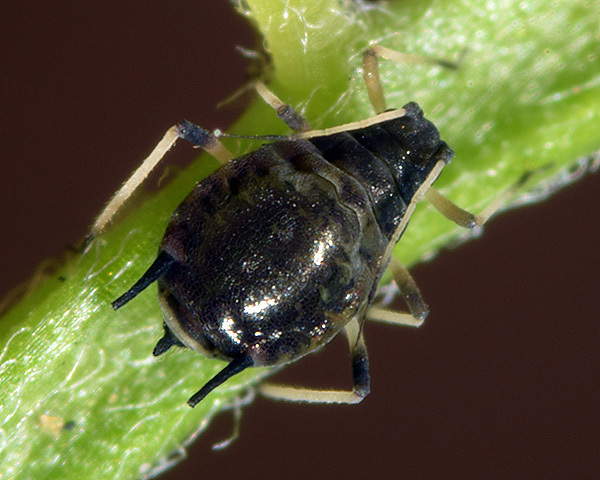 Overall, observed facultative symbiont prevalence in cowpea aphid was lower than that of some other well-studied aphids (such as Aphis fabae and Acyrthosiphon pisum), possibly as a consequence of Aphis craccivora's almost purely parthenogenetic life history. Also most of the surveyed populations were polymorphic for facultative symbiont infection, indicating that even when symbiont prevalence is relatively low, symbiont-associated phenotypic variation may allow population-level evolutionary responses to local selection. 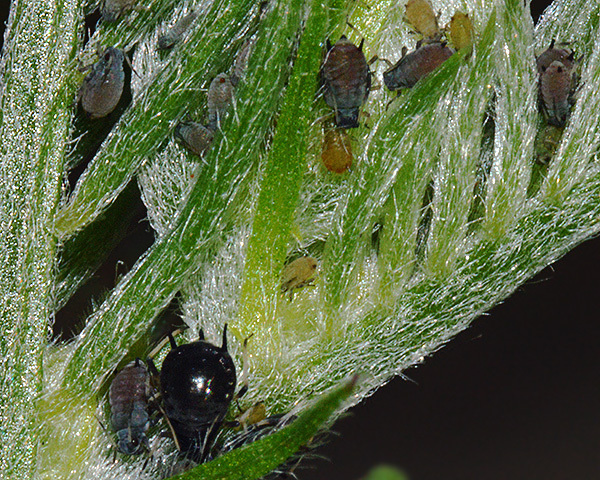 The symbiont Hamiltonella defensa defends Aphis craccivora against parasitic wasps. Despite these protective benefits, Dykstra et al (2015) found that this symbiont occurs only at intermediate frequencies in field populations. Transmission failures and infection costs likely limit the spread of protective Hamiltonella defensa in Aphis craccivora. The limited strain diversity observed for these defensive elements may also result in relatively static protection profile for this defensive symbiosis. Blackman & Eastop list 14 species of aphid as feeding on cowpea (Vigna unguiculata) worldwide, and provide formal identification keys. Of those aphid species, Baker (2015) lists 12 as occurring in Britain: Acyrthosiphon pisum, Aphis craccivora, Aphis fabae, Aphis gossypii, Aphis solanella, Aphis spiraecola, Aulacorthum solani, Brachycaudus helichrysi, Macrosiphum euphorbiae, Myzus ornatus, Myzus persicae and Smynthurodes betae. Blackman & Eastop list 6 species of aphid as feeding on groundnut (=peanut, goober pea, Arachis hypogaea) worldwide, and provide formal identification keys. Of those aphid species, Baker (2015) lists 5 as occurring in Britain: Aphis craccivora, Aphis gossypii, Aphis nasturtii, Myzus persicae and Neomyzus circumflexus. Blackman & Eastop list at least 20 species of aphid as feeding on pea (Pisum sativum) worldwide, and provide formal identification keys. Of those aphid species, Baker (2015) lists 14 as occurring in Britain: Acyrthosiphon pisum, Aphis craccivora, Aphis fabae, Aphis gossypii, Aphis spiraecola, Aulacorthum solani, Brachycaudus helichrysi, Macrosiphum euphorbiae, Myzus persicae, Neomyzus circumflexus, Rhopalosiphoninus latysiphon, Sitobion nigrinectarium, Smynthurodes betae and Megoura viciae. Ofuya (1997/1998) reviews chemical, cultural, physical and biological methods, and use of plant resistance for Aphis craccivora control in cowpea, and discusses prospects for integrated pest management. Souleymane et al. (2013) describes the search for new sources of resistance given the recent breakdown of resistance in Africa. Below we describe two recent studies, one in Ghana and the other in Democratic Republic of Congo, on innovative approaches to control of the cowpea aphid. Baidoo et al (2013) conducted a trial in Ghana to compare two neem-based products with lambda cyahalothrin for control of Aphis craccivora on cowpea. Significantly more cowpea aphids were collected on the control plots than on the treated plots. The numbers of aphids on the two types of neem-treated plots did not differ significantly. Harmonia axyridis numbers on the various treatments did not differ significantly. The two neem products were effective in reducing the cowpea aphid population so application of neem products can be used as an alternative to chemical insecticide. Munyuli (2009) conducted experiments in the Democratic Republic of Congo to investigate the effect of insect predators on Aphis craccivora and the yield of groundnut and cowpea. The assays were conducted using split-plot field-cage experiments and three treatments involved insecticide sprays, release of a mixture of indigenous insect predators (ladybeetles, syrphid larvae and earwigs) and a control. The results indicated that the release of predators significantly reduced the aphid population in the cowpea and groundnut fields. Overall yields were lower in the control treatments, and no significant differences were observed in field cages treated either with predators or with insecticides. In comparison to control treatments, biological control with predators increased yield by up to 58% and 66% for groundnut and cowpea respectively. This approach was recommended to small-scale farmers in order to obtain better yield and marginal economic return at low cost of production. Munyuli, T. 2009. Effects of native insect predators on population densities of Aphis craccivora and yields of Vigna unguiculata and Arachis hypogeae grown under various cropping systems, in Kivu Province, Eastern Democratic Republic of Congo. Tunisian Journal of Plant Protection 4, 197-209.